Traffic and congestion on our roads are increasing at very rapid rates across many European cities. A good share of this congestion is due to the movement of freight by road. The main aim of "Network of Regional Maritime Competence Centres II" (REMARCC II) is to create and promote competitive and sustainable intermodal transport systems in the North Sea region with waterborne transport (short sea shipping and inland navigation) as the main leg. REMARCC is divided up into three work areas (regional strategies for logistic competencies, logistic optimisation and logistic marketing) and six practical workpackages (WP) supported by a project management package. WP 1, North Sea Logistic Cluster, analyses the interaction and communication processes among stakeholders and decision makers from industry, administration, educational institutions, transport and logistics associations. REMARCC (Network of Regional Maritime Competence Centres) II has succeeded in promoting Intermodal transport crossing the North Sea Region. The effects of this and the recommendations from the project may have substantial environmental benefits if they are implemented in all relevant sectors and levels. One very interesting result from the project was the identification of a large gap between the sustainable transportation policy goals both on EU level and national level and the daily practice among transport operators and buyers. It turns out that environmental issues or goals have not had any measurable effects on daily practice at all. 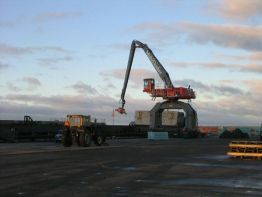 The project stated that the follow up of old shippers that shifted cargo from road to sea has been rather problematic. Change in internal logistic processes requires a certain period of time and are moreover not transparent to external persons. Hence, potential impacts on shippers and their company related modal splits exclusively attributable to the Remarcc II project can only remain to be estimated. In order to achieve the REMARCC II’s aim, they involved actors and stakeholders covering industry, administration, policy makers, education/qualification institutions, transport and logistic associations and research. The partnership will continue from year 4-7 based on the cooperation in the REMARCC II project. The network and its cooperation regarding the promotion of waterborne intermodal transport in the North Sea Region will continue to exist. Furthermore, the REMARCC II network submitted a proposal ‘NSP Future’ under a later call which was meanwhile approved.. The project has developed a concept for an internet based promotion instrument that has been presented and discussed among the project partners. The idea of the concept is to set up a portal about short sea shipping and inland waterways in the North Sea Region using the name www.northseashipping.org.